A panoramic view of San Francisco's principal tourist attractions. 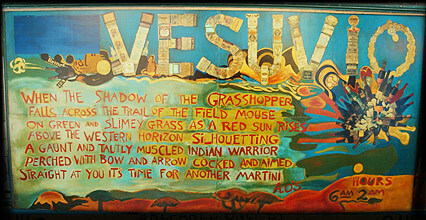 From a painting by Homer Ansley in the collection of Vesuvio Cafe. 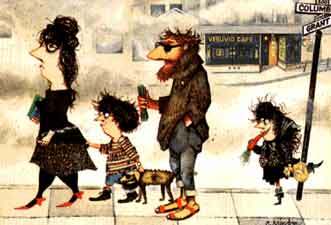 Here depicted on an afternoon stroll (they never get up before noon) in San Francisco's famous North Beach area is "Homo Beatnikus" and family. This unique offshoot of the human species was first discovered in the local bistros and coffee shops by columnist Herb Caen in the fall of 1957. 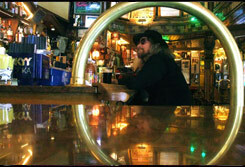 This world-renowned San Francisco saloon located in North Beach just across from the infamous City Lights Bookstore, was first established in 1948 and remains an historical monument to jazz, poetry, art and the good life of the Beat Generation. Vesuvio attracts a diverse clientele: artists, chess players, cab drivers, seamen and business people, European visitors, off-duty exotic dancers and bon vivants from all walks of life. On October 17, 1955, Neal Cassady, the real life Dean Moriarty of the quintessential Beat classic On the Road, stopped at Vesuvio on the way to the now legendary Six Gallery for a poetry reading, and the place has never been the same. It became a regular hangout of Jack Kerouac and other famous Beat poets and has become ground zero for pilgrims on the Beat trail ever since. It was here that Jack Kerouac once spent a long night in 1960 when he should have been on his way to Big Sur to meet with Henry Miller. Miller had written Kerouac that he enjoyed reading The Dharma Bums and would enjoy a visit from the emerging writer. Kerouac, however, had other plans. He continued to hoist drinks and called Miller every hour telling him that he was just a bit delayed in leaving the city. The two would never meet that night.